Jane's sketch of the Hesiodus Ray from October 2000. A map of the Pitatus and Hesiodus region from Lunar Quadrant Maps produced by the Lunar and Planetary Lab at the University of Arizona. Lunar sunrise and sunset rays are shafts of light which shine through gaps or notches in crater walls and mountains to illuminate the lunar surface. They occur only at very low angles of light - during lunar sunrise or sunset. Sunrise and sunset rays can range from thin parallel to triangular illuminations. Don't confuse them with impact crater rays – which are the debris blasted out by crater forming impacts on Copernicus and other young craters. One of these rays, the Hesiodus Sunrise Ray, is a favorite of mine. It's easy to find the crater, which is just south of Rupes Recta, or the Straight Wall. Lunar ray spotting gained popularity about 10 years ago thanks to an article about the Hesiodus light ray in the July 1996 issue of Sky & Telescope. A gap in the neighboring crater Pitatus provides an opening for the shaft of light to cross the floor of this crater at various times throughout the year. Since that time, many amateur astronomers have calculated when the sunrise or sunset will strike a crumpled or broken crater wall and create these short-lived light shows. Hesiodus is a crater 28 miles in diameter to the west of Pitatus, with a pass into the latter and with gaps in its north wall. Pitatus is a magnificent lagoon-like ring, 50 miles in diameter, on the southern shore of Mare Nubium. 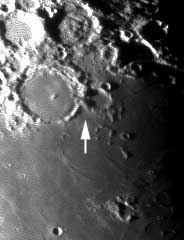 The light of the rising Sun shines westward through the two crater's common gap and bisects Hesiodus. Two weeks later, the eastward shining light of the setting Sun bisects Pitatus. Several times a year the geometry of Earth, Sun and Moon allow the light path to pass exactly through the low spot creating the ray. On October 19, 2007 I had mostly been showing people the Straight Wall, Plato, Cassini and Mons Huygens during our monthly sidewalk astronomy night. My eye drifted from the Straight Wall to Pitatus and Hesiodus. The center of Pitatus was bathed in sunlight, which cast a shadow on its central peak. The crater floor looked convex or dome-like to me. And guess what, the Hesiodus Ray, a narrow triangular shaft of light, illuminated the dark floor of Hesiodus. You'll find predictions for about 75 rays, including the Hesiodus and Pitatus Rays, on the Robinson Lunar Observatory webpage. There are many opportunities to see each of these two fleeting shafts of light next year. The first dates listed are January 16 and 31 2008, calculated at the geographic center of the US. Now get out and catch some rays!